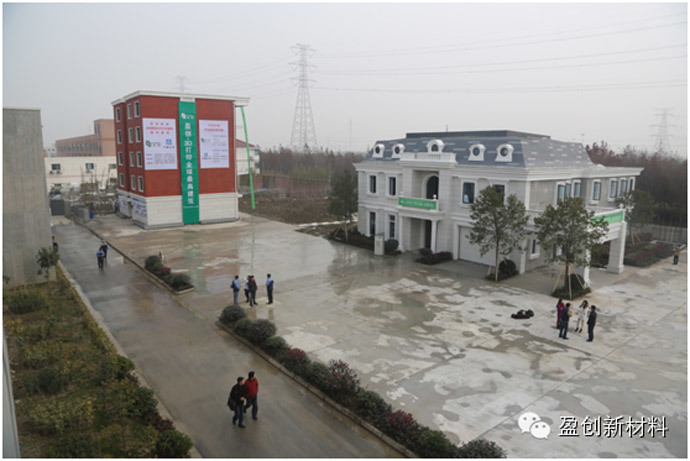 A Chinese company has used 3D printers to create five-story homes using construction waste. The project architects say this is the world’s tallest building constructed using this technology. The new project is the brainchild of Shanghai-based WinSun Decoration Design Engineering Co, who also managed to use 3D printing technology to create a 1,100 square meters villa in the Suzhou industrial park of China’s Jiangsu Province. It is not known how comfortable the buildings will be to live in, but one cannot argue with the cost, the villa complete with interior decoration cost a little over $160,000. According to the 3D printing website 3ders.org, it took the company a day to print one level of the building and another five to put it together. In order to undertake the mammoth task, the company used a massive 150-meter long and 6 meter high printer. They use recycled building waste for the materials or ‘ink’ which also contain glass fiber, steel and cement and special additives. The process works by secreting layers of construction material on top of each other to create densely packed building blocks. The company says the buildings are perfectly safe to live in, and are expanding their horizons and hope to build housing blocks as tall as 12 stories in the future. WinSun estimates 3D printing technology can be very savvy: it may save between 30 and 60 percent on building materials with costs slashed by 50 percent up to 80 percent. The firm said that it may also shorten production time by 50 to 70 percent. The company has been building up a reputation. In April, it managed to print 10 full-size houses in a day. 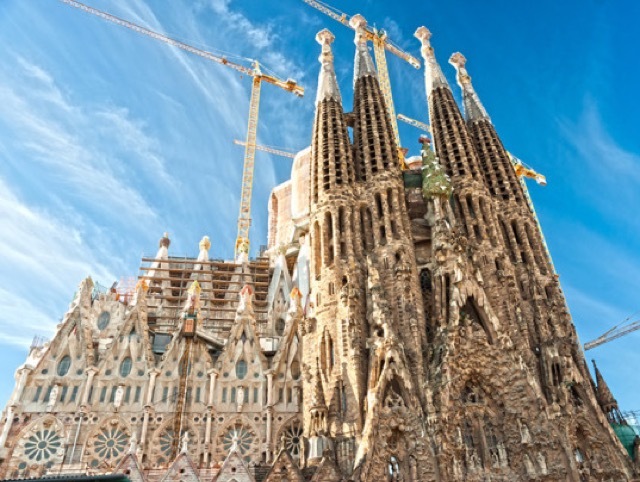 This article brings together some of the recent engineering and construction achievements that have come about as a result of 3D printing, and gives a glimpse into what 3D printing and architecture may produce together in the future! Still the question remains; Would you live in a 3D Printed House? Would You Live In A 3D Printed House? The potential of additive manufacturing, also known as 3D printing, to change the way buildings are made is indisputable. It’s being touted as a solution to challenges in our cities ranging from the need for affordable housing to infrastructure modernisation. The process has been slow, but it may well be a key ingredient in the future of the building industries. In the last two years, technological advances in scalability are allowing 3D printing to move beyond small-scale architectural models and prototypes. It is now being used in actual housing and infrastructure construction—achieving lower labor costs and finally delivering those long-promised economies of scale. Helped along by the increasing prevalence of digital 3D modelling software for building and infrastructure design, some of the new results are pretty mind-boggling, too. Here are three of the latest examples from around the world, which reveal the ways in which 3D printing is changing approaches to architecture, engineering and construction. Road and bridge infrastructure is just as important as housing to make cities liveable and workable. Until recently, direct metal laser sintering (DMLS), essentially 3D printing metal parts, was used extensively in the aerospace and automotive industries. But it was not explored thoroughly for usability and cost-effectiveness for bridges and other types of urban infrastructure. The primary reason is because each bridge is a unique design and the savings from prototyping and manufacturing aren’t as obvious. Moving now to Australia, global engineering firm Arup was tasked with creating components for an unconventional pedestrian bridge. Arup decided to use 3D printing as an internal research project to determine how a laser-sintered, printed metal part could hold up to structural standards. The parts for such a bridge also had to be load-bearing connections. Arup’s engineers came up with a complex design with “root” supports and extra struts were added to the part to support it during printing. The struts allowed for a hollow design that reduced the overall weight of the bridge node and was more aesthetically pleasing than a traditionally machined one. The design and production of the bridge nodes allowed new degrees of design freedom and Arup is already using the research on other projects. The first entrant in the race to build a fully 3D-printed house is Amsterdam’s DUS Architects. Using The KamerMaker (room builder), a 20-foot-tall custom 3D printer created by DUS and Ultimaker, the architecture firm has been printing a house along one of Amsterdam’s famous canals bit by bit for the last year-and-a-half and expects to have it completed in 2015. The KamerMaker works essentially like a larger version of a desktop Makerbot. The printer head extrudes the melted plastic material along the programmed path on the X and Y axes and when finished moves up one step along the Z axis. Unlike its desktop cousin, it can print whole rooms. The exterior walls of the Canal House cover a range of sustainable materials, including Hotmelt—a type of industrial glue developed by German chemicals manufacturer Henkel. Comprised of 80 per cent vegetable oil, Hotmelt is used to form bio-based plastics. DUS and Henkel are also experimenting with eco-concrete. They are testing out a variable concrete mix that allows the team to add insulative material and colour to the wall sections. Once printed, the wall sections fit together sort of like Lego. While the Canal House won’t be completed until next year, it has already created several innovations, including one of the largest-scale 3D printers in the world and advances in sustainable materials. On the other side of world comes an entirely different perspective on 3D-printed housing. While the Canal House is experimental, architecturally elegant and pushes the envelope of materials science and constructibility, it will take three years to complete. 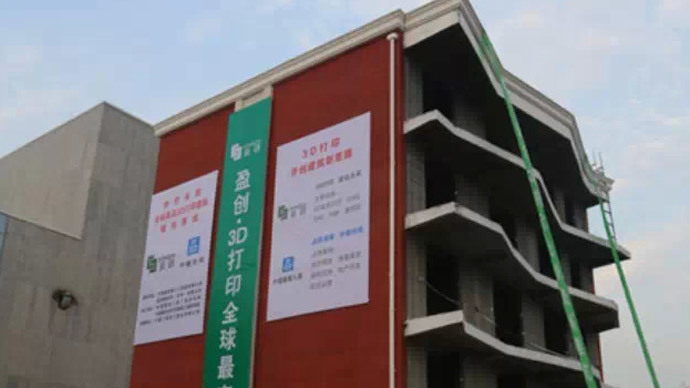 Meanwhile, Shanghai WinSun Decoration Design Engineering claims to have erected 10 3D-printed houses—each costing about $4,800—in less than 24 hours. There’s some debate over whether Shanghai WinSun’s houses are genuinely a 3D creation because they were printed not as a single item, but in parts that were then assembled onsite. But the feat is impressive nonetheless. The simple, concrete-framed buildings were made using an enormous 3D printer that is 150 meters long, 10 meters wide and 6.6 meters high. The houses each cover an area of 200 square meters and were designed to someday provide affordable housing to the homeless. 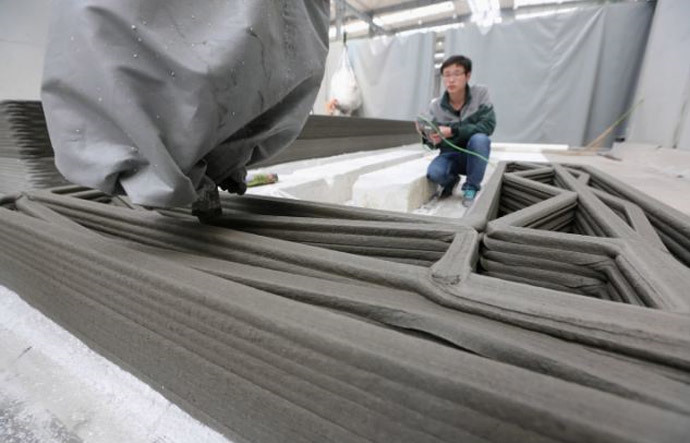 The 3D-printed “ink” of each structure is a combination of recycled construction and industrial waste materials formed into structural concrete and wall panels. These houses may not win any design awards, but the manufacturing concept that delivered them so cheaply and quickly is a leap forward in sustainable tilt-up construction. The process contains costs and could be applied to solving housing crises in major cities around the world. The above examples are just three among the many new uses of 3D printing at building scale that are popping up around the world. They clearly point to a world where advances in 3D-modelling software in combination with advances 3D-printing technologies (both in terms of size and materials like concrete and carbon fibre) will allow architecture and construction professionals to more efficiently and more sustainably design and implement building solutions for our rapidly urbanising planet. As the organic form of Arup’s root supports suggest, 3D printing may also indicate a future of beautiful new architecture and infrastructure in our cities. For the architecture and construction fans; How 3D printing (and mud) may play a significant role in the buildings of tomorrow. We’ve written about how 3D printing has not made a significant impact on construction. It seems this may be changing. One company has not only taken this industry head on, but it’s helping the poorest in society at the same time. Italian firm WASP is using 3D printing to build affordable housing in poverty stricken areas. The printers use organic materials such as mud and natural fibers that are readily available and turns them into dwellings that can be easily transported to wherever is needed. The inspiration for the idea came about after founder, Massimo Moretti, watched a particular type of wasp, a mud dauber, build its nest by depositing and shaping wet mud. Moretti wondered why he couldn’t use nature to build affordable houses in the same manner. And so the idea for his innovative project was born. Using 3D printing and the natural resources, Moretti was not only able to reduce the cost of building, but the speed in which they could be constructed. Moretti’s company is rather appropriately called WASP. It actually stands for World’s Advanced Saving Project, and is dedicated to providing affordable housing to impoverished people worldwide, using inventive technology. A scaled down version of the WASP project was showcased at the Maker Faire in Rome, Italy, earlier this year. The faire is a mecca for debuting innovative technological projects from all over the world, and the WASP project was well received. Mud huts are not a new as human dwellings, but the way the WASP project constructs them are. By 3D printing them in blocks, there is a much larger surface area, which means that they dry more quickly than traditional thicker bricks. As the 3D bricks are triangular shaped, this also means that they are stronger and can hold more weight than a traditional rectangular brick, whilst also using less material. Using this shape of brick creates a larger interior space compared to traditional bricks, meaning homes can be built that are ten feet tall. Perhaps the most impressive thing about all this is that you don’t need specialist printer. The 3D printer used for printing the mud bricks is fairly standard. You simply feed the mud and fibers into the extruder head and program whatever shape brick you require. Whilst no new houses have been built yet, WASP hope to start construction on their very first dwelling early next year. And although there are no plans for locations either, rumors are that the first mud houses could be situated in Sardinia, the Italian island just off the coast. While this may be an odd choice for their first project location, the team at WASP state that they are keen to keep their first location close to home. This will enable them to iron out any problems that may occurs with the first build. After that, they are likely to move on to more remote areas. After only 45 hours, Local Motors successfully 3D printed the Strati, an electric two-seater which can drive for up to 120 miles before charging and hit a maximum speed of 45mph. Interested in buying one? They’ll be available later this year, at a price ranging from $18,000 to $30,000. While some people have successfully 3D printed buildings, others have taken the same approach to the car manufacturing business, as a company has just come out with a car called the Strati that’s the first 3D-printed car in the world. Scientific American reveals that it took Local Motors only 45 hours to build the Strati, a two-seater “neighborhood” electric car that has a range of up to 120 miles and a maximum speed of 40 mph. Interestingly, the company plans to start selling Stratis for anywhere between $18,000 to $30,000 later this year, as it further refines its 3D-printing procedure. The car’s design was chosen from over 200 proposals submitted by Local Motors’ online community and Rogers says that the main advantage of 3D printed cars is that local communities may adopt such procedures to build cars best fitted to the resources available to them. Even so, while using 3D printing technology to build a car might lead to less wasted material, a lot of energy might actually be required to print such vehicles.